Rev. Maridel Whitmore (Full Elder) from Phila. : St. George's to Havertown: Hope. Rev. Blaine Wenger (full elder) from Lampeter to Manheim: Ruhl's, full-time. EPA Conference offices will be closed on Monday, Feb. 20, for President's Day. We just learned that the Music in the Black Church Experience choir fest happened on Sunday, Feb. 12, at Tindley Temple UMC, and seven Philadelphia-area choirs performed in a well-attended event. The Feb. 19 date on the flyer was an error and the result of a miscommunication. Pocono Plateau's UM Confirmation Retreat will happen from Feb. 24 (7 PM) to Feb. 26 (1 PM), not Feb. 24 to March 11, as reported. Their theme is "Discover: Light for the Journey." Rise Up and Pray! is the elevating main theme of the 2017 Eastern PA Annual Conference, which will return to the spacious Expo Center in Oaks, Pa., from Thursday to Saturday , June 15-17. Preachers, prayers, musicians, liturgists and others will center the gathering in the practice and power of prayer, no doubt invoking the God of eternal grace to "Grant us wisdom, grant us courage, for the facing of this hour." That focus will also receive special attention when special guest the Rev. Tom Albin, Dean of the Upper Room Chapel in Nashville, offers a Friday teaching session on prayer. Three bishops will preach during this annual conference session including two familiar voices and a new voice on the NEJ College of Bishops. Resident Bishop Peggy Johnson will preach for the Opening Worship and Eucharist Service on Thursday afternoon. New Bishop LaTrelle Easterling, who leads the neighboring Baltimore-Washington Conference, will preach for the Ordination Service ("Rise Up and Lead!") on Friday night. Bishop Peter Weaver , a retired former leader of our own conference and the Philadelphia Episcopal Area, will preach during the Memorial Service ("Rise Up in Glory!") on Saturday morning. A fourth sub-theme, "Rise Up for Generations" will herald the annual celebration of ministry that recognizes new clergy retirees and new elders and deacons preparing to follow in their footsteps. The other usual agenda highlights-clergy and laity sessions, ministry reports, the budget, nominations, resolutions, holy conferencing, other guests and special offerings-will all occur during the two-plus days of annual conference. And all of it will be surrounded by prayer. Annual Conference registration will be open from March 19 to May 19; and resolutions and reports are all due by April 21. We will report more details and present the new conference theme logo on the conference website and in NEWSpirit Digest next week. Stay tuned. "Actively Discovering Human Diversity." With that intriguing title, Gretna Glen Camp & Retreat Center in Lebanon will host two dozen teenagers of different racial-ethnic groups, all in grades 8 to 12, for a weekend retreat March 3-5. UM News Service yesterday shared with the denomination in its Daily News Digest a link to Bishop Peggy Johnson's latest blog essay about "Hidden Figures." (Actually, they often share her many thoughtful, eloquent Bishop's Blog writings with the entire UMC through their News Digest and the www.umc.org website.). You can find it either on her blog page or on our website. Sometimes people become "hidden" because of their gender, class, ability, orientation or religion. Whatever the reason, the effect is the same: devaluation, invisibility and a huge loss for all of us. That is because when one of us shines, we all shine. But when any of us and our abilities are cast into shadows or marginalized, we all suffer more than we can know. If you haven't read this full essay yet, we recommend you do. Recalling the bias and discrimination faced by three African American women who worked for NASA during the beginning of the U.S. space program, her timely reflection challenges us to "do a better job of bringing our gifted leaders out of hiding, while empowering everyone to achieve for the good of all." She also lifts up as "important for everyone" our celebration of black history in February and throughout the year. You can listen in on historic discussions about American Civil Rights and Black History through recovered audio recordings from SoundTheology. The programs are provided by Audio-Rescue.com and the United Methodist General Commission on Archives and History. Some feature interviews on "Night Call," the 1965-1969 nightly radio show created and co-produced by the then-Methodist Church. Also included are audio interviews produced in 2004-2005 with noted United Methodist leaders who were part of the African-American Central Jurisdiction of the former Methodist Church. Learn more on Sound Theology's special Civil Rights & Black History page. Read more about this valuable historic treasure in an article, "In Honor or Black History Month: Hear Historic Leaders Address Significant Issues," on the Texas Conference website. More state budget cuts that will hurt the poor, climate change and hydraulic fracking that undeniably hurt the environment, expansion of gambling, sanctuary versus detention for undocumented immigrants, nonpartisan fairness versus gerrymandering in state redistricting...the list of crucial issues for the new, 2017-2018 Pennsylvania legislative assembly is long. And the need for keen legislative monitoring and advocacy on behalf of United Methodists perhaps has never been greater. Want to see and hear a truly inspiring testimony? Check out a brief video story about the Rev. Joe Martin, pastor of Fallsington UMC. A METV reporter visited friendly the church on Sunday, Feb. 5, to feature their "Pastor Joe." The former New Jersey television engineer for 40 years, a former atheist who saw most Christians as hypocrites, shares his story about first fleeing but then finding God in his late 50s and soon becoming a pastor-something he describes as "pretty amazing." By the way, we received this story and video link from the friendly folks at Fallsington UMC, which is how we're able to share it with you. If your church or pastor or members are featured in a newspaper, TV program or online media, please let us know, and send us the website link so we can share your good news with the conference (and maybe with the entire UMC connection) through our Methodists Make News page. United Methodists will celebrate their annual UM Night with the 76ers on Friday, March 17, at 7 PM, at Philly's Wells Fargo Center (3601 South Broad St.). The Eastern PA Conference United Methodist Men invite you to come watch the winning Sixers battle the Dallas Mavericks. We have 100 guaranteed tickets available at special prices to all UM churches through their men's ministry groups (and not just chartered UM Men's units). A portion of ticket sale proceeds will be donated to support Conference UM Men's ministries. Additional tickets are available, but our guarantee expires Feb. 24. Each church's men's group leader should contact the 76ers to buy group tickets right by Feb. 24. Individual tickets sales are not included in this offer. The Southwest District's Racial Justice Dialogue series will resume on Monday, Feb. 20, at 6 PM, with a light supper and in-depth discussion, at Faith UMC Manheim Township, 1290 Fruitville Pike, Lititz. The Rev. Derrick Gutierrez will lead conversation about goals and practical steps people and churches can take to overcome bias and racism. Visit the SW District Racial Justice Dialogue Facebook page to learn more. Contact the Rev. Jason Perkowski (717-333-9238), host pastor and co-leader, if you wish to attend. The quartet of Lifetree Cafés that meet in the Lancaster area compose an ecumenical "outreach ministry where people can discuss how faith and life intersect. Please join us!" writes the Rev. Jason Perkowski. He is the pastor of Faith Manheim and Oregon UMCs and a co-leader of the Lifetree Café that meets at the General Sutter Inn in Lititz on Monday nights, at 7 PM, for about an hour. Visit their website for more info and video clips about the fascinating, topical discussions enjoyed by guests who come to fellowship, to share a meal, maybe a beverage and some food for thought. Especially invited are persons not involved in a church but who still want to explore in comfortable, non-judgmental conversation ideas of life and faith and other interesting, timely topics. The Feb. 27 topic should spark plenty of interest and conversation. "Police Brutality or Necessary Force: Stories from Both Sides," will be discussed that Monday at 7 PM and at other Lifetree Cafés that week. "This is obviously a difficult topic with which our nation is wrestling," writes Perkowski, who will lead the discussion. "So, we invite individuals to come and be a part of the conversation in a safe and open format--all thoughts are valued and welcomed." Local law enforcement officers have been invited to be a part of the discussion. There will be video clips and opportunities for small group discussions around the dinner table. Attendees can purchase dinner and drinks during the discussion--and all are invited to continue the conversation after the formal program concludes at 8 PM. If you want to learn how to lead or host Volunteers in Mission (VIM) teams, then be sure to attend the UMVIM Team Leader Training on Saturday, April 1, from 9 AM to 3:30 PM at Ardmore UMC (200 Argyle Road, Ardmore), These teams bring needed repairs and recovery to damaged homes and disaster-stricken areas, as well as compassion for victims, while bearing the love of Christ in their hands and hearts. The $35 cost includes training materials and lunch. Learn more and register online by March 27. The Rev. Tom Lank, an ordained deacon in the Greater New Jersey Conference, is VIM Coordinator for the Northeastern Jurisdiction. He has organized international mission journeys in Africa, the Caribbean, Central America and South America, and domestic mission journeys in nine U.S. states. Team Leader Training is recommended for all first- time VIM team leaders, but all interested persons are welcome to attend. For more information contact the Rev. Greg Ellis, Conference Coordinator of Disaster Ministry & UMVIM, at gellis@epaumc.org or 484 350 5965. There's more information about the April 1 Fresh Expressions t raining event that could change your church. " Changing Church for a Changing World: Fresh Expression Vision Day" will happen on Saturday, April 1, at Mount Carmel UMC, 2203 Harmonyville Road, Elverson PA. J.R. Briggs and Kristin Beckert, both skilled church planters and trainers, will bring their creative, strategic ideas as gifted facilitators. The Eastern PA Conference is a co-sponsor; so members can attend for a discounted $20 each. "What makes you hopeful?" Two dozen Eastern PA United Methodists gathered for dinner and dialogue Feb. 4 to wrestle with that timely question two weeks after the Jan. 20 inauguration of President Donald Trump. They were participating in a momentary movement that has called upon people of conscience and concern to connect with one another in a spirit of Shalom and " Reclaim the Common Good." When you experience God's love, you want to share it with everyone! The United Methodist Foundation for Evangelism helps annual conferences annually honor extraordinary clergy, youth and adult laypersons with the Harry Denman Evangelism Award for sharing with everyone God's message of love through Jesus Christ. As Christians, we work in a variety of ministries and contexts with a common goal to build up of God's Kingdom. This year, until May 5, the Eastern PA Conference's Congregational Development Team (CDT) is pleased to accept your nominations of persons to receive the 2017 Harry Denman Evangelism Award. That noteworthy award signifies a remarkable commitment to introducing others to the living gospel in ways and places where "new believers can encounter Christ." addressed to the EPAUMC/Congregational Development Team, c/o of Suzette James/. Attn: Denman Award Nomination. Or mail them to the Eastern PA Conference Office, ATTN: Dr C. Kurien (identified as "2017 Denman Nominee"), P.O. Box 820, Valley Forge, PA 19482-0820. NEWSpirit Winter 2017 issue is online and in the mail. United Methodist Communications is offering leaders new online training courses to help their churches really shine. Your Church Website ($39.99) introduces tools to plan, build and launch a successful online strategy, meaning a website and more, that helps people connect with local churches in a new, more immediate way. Effective Church Marketing ($29.99)course leads participants through a process of examining, dreaming, planning and promoting ministries that make an impact. When they finish, church teams will have a complete marketing plan ready to put into action. Both new courses will be offered year-round. And both are open-enrollment, meaning students can register for them at any time. Do you feel called to serve in ministry beyond your church? Or can you recommend someone who has a desire for servant leadership that can affect many persons, churches and communities? The Committee on Nominations will receive nominations until March 1 for gifted, dedicated persons to serve on Conference boards, committees and other leadership bodies. All persons who want to serve must complete and submit the online Leadership Service and Interest Form by March 1. You can nominate yourself to put your unique spiritual gifts into action for others. Or you can invite, recommend and encourage the nomination of others. The committee is committed to diversity among members who serve, welcoming young people, people of color and people with handicapping conditions especially. See a list of service opportunities, and use our form on the Conference website. (The new due date is March 1, 2017.) Or you may call (215-844-9564) or write to the Nominations Committee chairperson to recommend someone else. All potential nominees will be contacted by the committee prior to any commitment to serve. Grants of up to $5,000 are available twice a year from the Conference Board of Trustees to fund start-up mission projects, new ministry initiatives, camp or retreat scholarships, racial-ethnic ministries, etc., but not for building expenses or salaries). Deadline for Spring grants is March 1. See the grant Dewees Grant Requirements and the Dewees Application Form to learn more. Gretna Glen and Pocono Plateau Camp & Retreat Centers both invite churches to have confirmation classes in their neck of the woods, learning all about faith in the midst of God's creation. Gretna Glen's three Confirmation Camp weekends- March 31-April 2, April 7-9 and October 13-15-will focus on the five vows of affirmation: prayer, witness, gifts, service, and presence, say planners. "Each vow comes alive as confirmands participate in hands on activities, discussions, and reflections that help draw connections from the act of confirmation as the start of a full-time life of faith." Cost is $90. Register using their Brochure. Pocono Plateau will have its UM Confirmation Retreat Feb. 24 to Feb. 26 (Friday at 7 PM to Sunday at 1 PM. Their theme: "Discover: Light for the Journey." Be sure to read Bishop Peggy Johnson's article about summer camp, " Our camps-changing seasons and young lives." Churches that feel the Holy Spirit moving them to take a serious, open-minded look at their mission and future in ministry, in addition to churches identified by their district superintendent, are urged to send teams to attend "Vital Church Mergers and More" March 25, from 8:30 AM to 12 PM, at Christ UMC Lansdale (1020 S. Valley Forge Road). Cost: $10 per church (payable to Eastern Pa. Conference of the UMC). Pay onsite. Each church attending should first read Dirk Elliot's book Vital Church Mergers. District Superintendents have copies available. The Congregational Development Office has 30 copies. Please pray daily for vision from the Holy Spirit to help you see where God is leading your church. Contact the Rev. Gordon Hendrickson at 267-258-9507 or gordonacts6@gmail.com. The Conference Health & Healing Council urges all churches to join the 10,000 Church Challenge, initiated by the UMC's Global Ministries as part of its new Abundant Health initiative. Bishop Peggy Johnson is promoting this effort in both of her Philadelphia Area conferences, Eastern PA and Peninsula-Delaware. Your church is invited to help increase opportunities for healthy lifestyle choices by promoting: Physical Activity; Healthy Diet and Nutrition; Tobacco-free and Drug-free Living; and Mental Health Education and Promotion. One of our four denominational goals is to improve Global Health. After raising over $68 million to fight malaria in the "Imagine No Malaria" campaign, it is time to broaden the focus of "Abundant Health." Global Ministries' goal is to sign up 10,000 churches across the connection, asking each to choose a health focus for its congregation and community. Every church that signs up will receive ideas about education, treatment and prevention; and when it implements ideas and activities it will be designated a Health Promoting Church . Sign-Up Today . Get more information. Deaconess Sharon Hachtman,RN, FCN, is Health & Healing Council, Co-Chair and campaign contact. Visit the council webpage to learn more. A New Lenten Study Curriculum is being produced by Hopewell UMC for use in 2017 free of charge by any and all UM churches. Contend for the Faith: Lessons from Jude. Within the brief but rich Epistle of Jude, we find marvelous encouragement for a 21st-century church in America, which is itself in need of defense, purification, and hope. This seven-week study designed for group participation will feature Elders from the Eastern PA Conference who have written the curriculum and are featured in the DVD presentations. For more information contact: Deb Boyd, Director of Lay Ministries, Hopewell UMC at boyd@hopewellumc.org or check out Hopewell UMC's website. UMCOR (UM Committee on Relief) and the Northeastern Jurisdiction Volunteers in Mission will provide training March 26-29 for persons wanting to lead the church in disaster response and in its wider mission in God's world. Our own Pocono Plateau Camp & Retreat Center will host the classes, ranging from beginner to advanced, including: UMCOR's Foundations; Early Response Team Advanced (201-level) Training; using the Connecting Neighbors curriculum; Spiritual and Emotional Caregiving; and more. There will also be workshops on Global Health, Communication Technology, Race and Privilege, Asset-Based Community Development, Caring for Creation, and other mission topics. No prior qualifications are necessary. CEUs are available. Register now. Early-bird rates apply until Feb. 26. For more information contact the Rev. Tom Lank, UMVIM-NEJ Coordinator, at 919-428-0461, coordinator@umvimnej.org, or visit www.umvimnej.org. Order your 2016 Conference Journal before they're gone! A limited number of printed 2016 Eastern PA Conference Journals are available. Order yours today for only $30 each. You can order and pay online or send a check, by USPS, to: EPA UMC, Attention Gloria Knoeller, PO Box 820, Valley Forge, PA 19482-0820. What's in the Journal? A lot! Contact information for Conference staff, clergy, Camp and Retreat Centers, Districts, and United Methodist Boards and Agencies. Also, clergy appointments, pastoral salaries and service records. Plus, all about the 2016 Annual Conference; Conference statistics for 2015; historical highlights; and conference policies and procedures for clergy, staff, and others. Questions? Please contact Gloria Knoeller at gknoeller@epaumc.org. Rev. Lloyd Speer will conduct several training workshops in 2017. The next will be Feb. 23 at Christ UMC Fairless Hills. To register, go to www.prepare-enrich.com to fill out and mail a printable registration form. The cost is $220, and includes certification, lunch and materials. For more information, contact Lloyd Speer at 215-943-2343, or lfspeer3@comcast.net. This year's dates for Changing Racism Workshops, led by Visions, Inc., are March 31-April 2 and October 27-29. The March location will again be the Daylesford Abbey, 220 South Valley Road, Paoli, PA. Visit our Changing Racism Workshops webpage to learn more and to register. 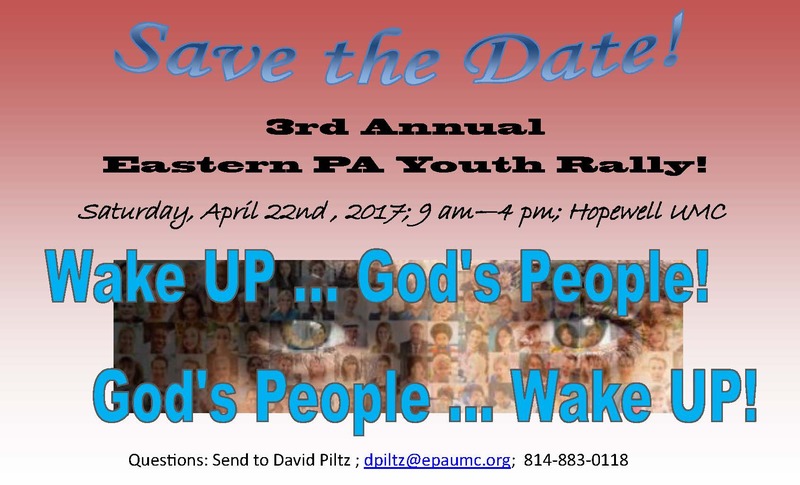 Plan to attend the 3rd Annual Eastern PA Conference Youth Rally on Saturday, April 22, 2017. For the first time, this youth rally will last all day, from 9 AM to 4 PM. We're planning fantastic features, with dynamic speakers, soul-stirring music, fun games, powerful prayers, laugh-out-loud humor, great food and hospitality, and enough friendship and fellowship moments to give you a lifetime of memories. Don't dare miss it! See and share the flyer, and look for more details, coming soon. At Black Rock Retreat Center, Quarryville, PA. Theme: "The Authority of Scripture."